Exclusive: DKNG Walks Us Through The Creation Of Their Amazing SPIDERVERSE Posters | Birth.Movies.Death. Mondo's latest required a whole bunch of SPIDER-MAN research. Back in December, we brought you a step-by-step breakdown of Matthew Woodson's gorgeous Under The Skin print, and we were delighted when the Birth.Movies.Death. readership responded so strongly to that highly-detailed bit of nerdery. In the time since, a number of readers have asked when we might do another of those breakdowns, and I'm thrilled to have a new one to share with you today, this one based on Mondo's latest open-edition print: a sprawling tour of the Spider-Man universe from DKNG. 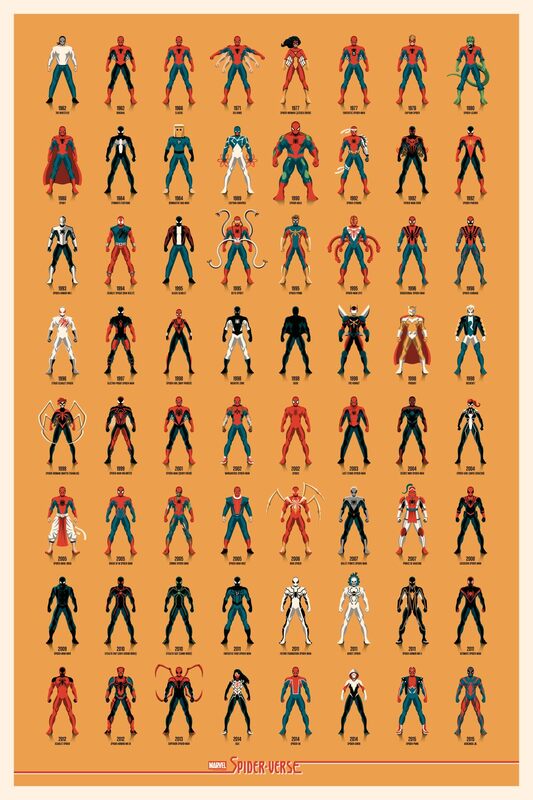 When Mondo approached us to create a poster showcasing all of the Spider-Men and women of the Spider-verse, we didn’t quite realize the far reaching scope of the universe. 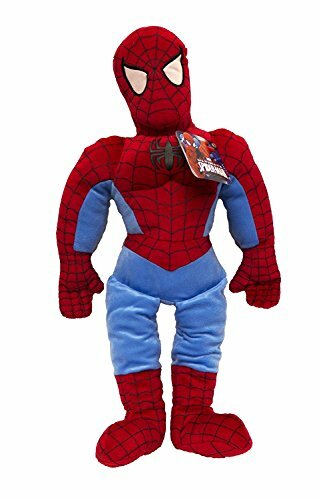 The project began with a deep dive searching for every Spidey-related character that the internet had to offer. 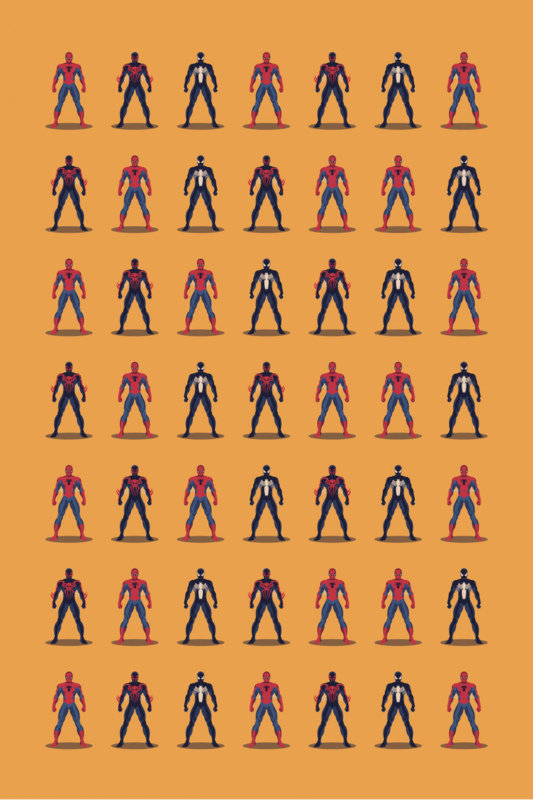 We found several fan art creations and infographics that attempted to organize the Spider-verse, and through lots of cross-referencing and fact checking from the good folks at Mondo, we began to arrive at our final set of characters. 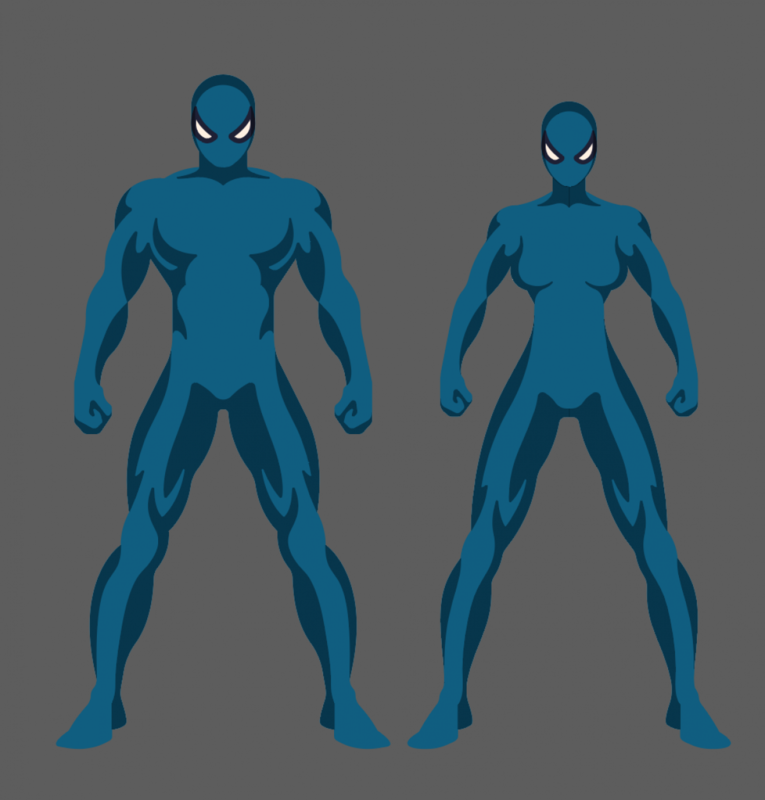 From there, the first step of the project was to define the look of our Spider-Man model that would be the basis for all of the various characters and costumes. 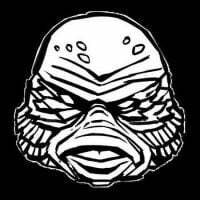 The base template provided the canvas on which we’d build all subsequent characters. 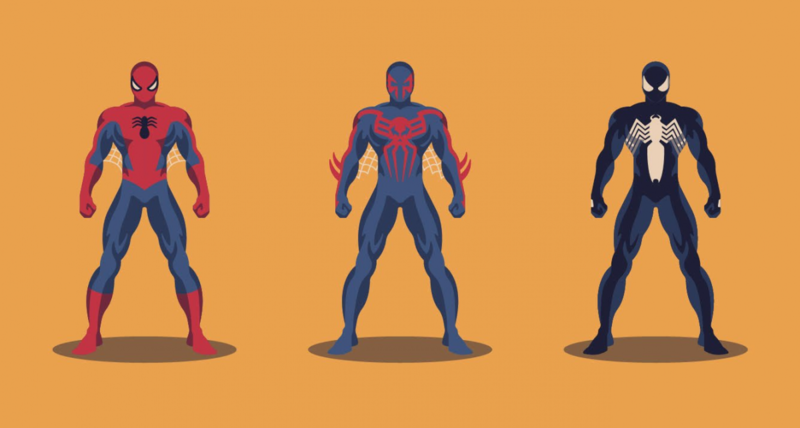 From there the first three characters starting taking shape, and we started learning what aspects of each Spidey might remain consistent throughout the series and what unique qualities would set them apart. As we progressed through the series, we also started looking at the overall composition and started to experiment with the grid system and background color that we’d use for the main edition of the poster. We eventually landed on yellow as a neutral background color that would work with all of the various costume designs and color combos. 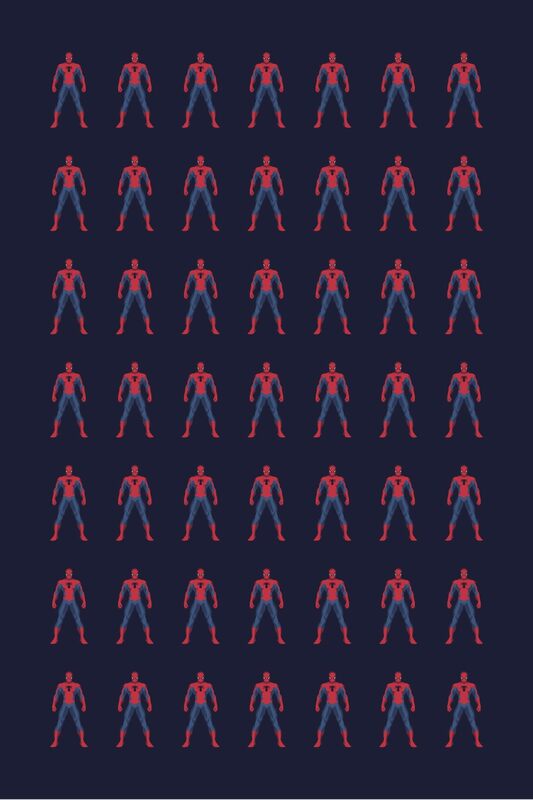 In this early example we used the first three Spider-Men to give us a sense of how the final composition could look. 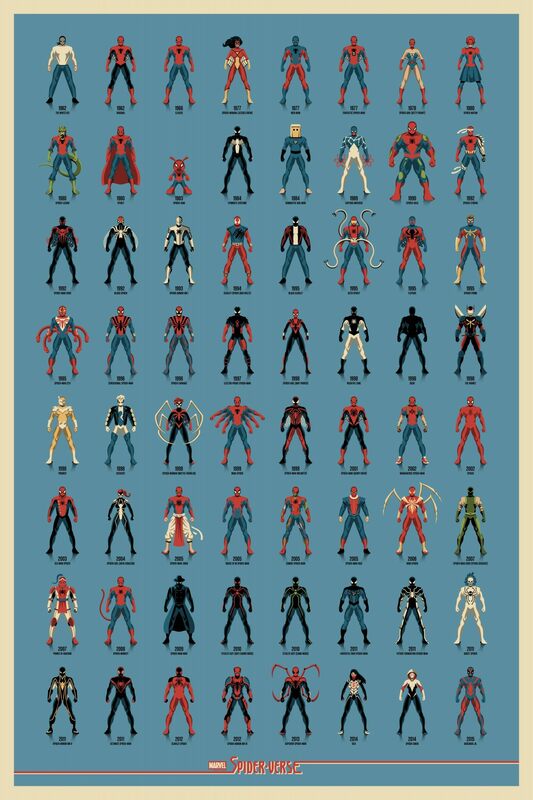 As we continued to make our way through the Spider-verse, research continued to be a big part of the project, referencing multiple examples of each Spidey look to achieve as much accuracy as possible. 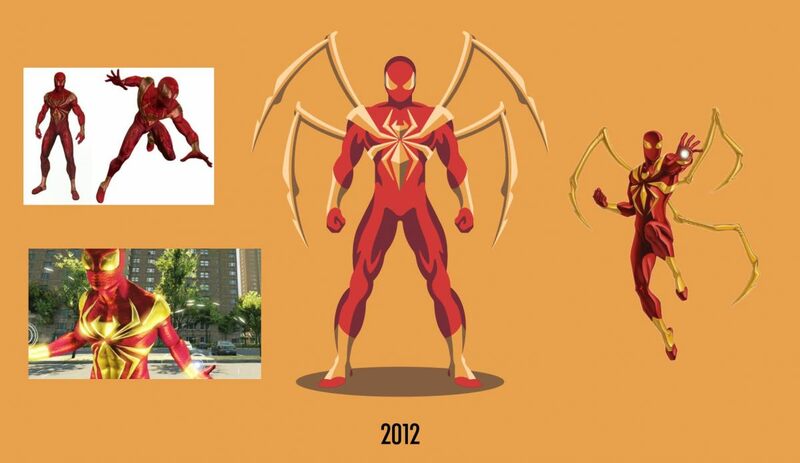 In this case, we looked at several different iterations of the Iron Spider to identify the key components of the costume. While the characters progressed, we also started experimentation with a title treatment for the poster. In this early example we used the original Amazing Spider-Man logo, but as the project progressed, we decided to incorporate other members of the Spider-verse and the titling followed suit. 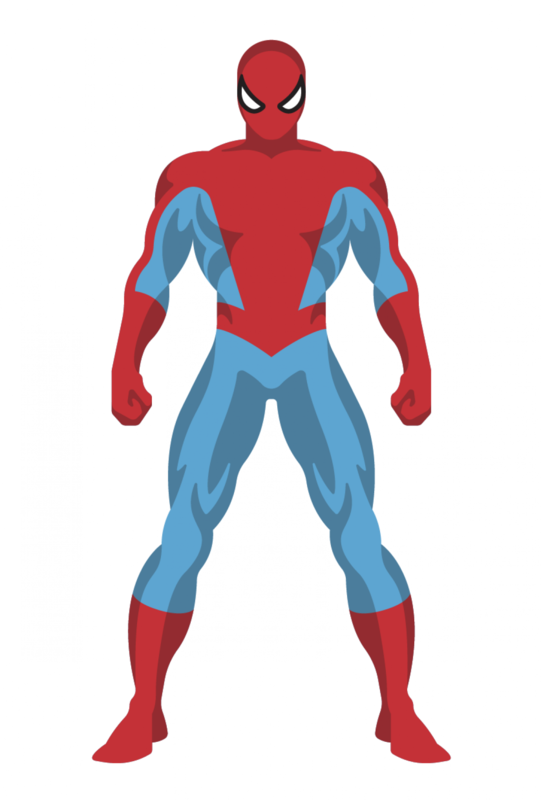 As we started to expand the Spider-verse, the inclusion of female characters led to building a new base template that would serve as the basis for Spidey’s female counterparts. From there we determined that we had enough characters to split the project into two prints - the main yellow edition and the variant blue edition, each with it’s own unique characters represented. We also incorporated the Spider-verse logo for the title treatment. The final screenprinted posters will be 24” x 36” with the yellow edition using 7 ink colors and the blue variant using 8 ink colors. Quite the undertaking, no? Paid off, though. These posters turned out absolutely incredible, and we're thrilled to have been given the opportunity to show you how they came together. Thanks to Nathan Goldman, DKNG, and the folks at Mondo for helping us put this thing together for you. Reminder: both of the Spiderverse posters above can be picked up right now via the Mondo website. This is a timed edition, which means that both will remain on sale (read: won't sell out) between now and Sunday (March 26th) at 10AM CST. Head on over there to grab yours now! "Sir, please remove yourself from that landmark." Ladies and gentlemen, meet Sharon Tate.